When someone dies his/her properties are usually inherited by relatives. Let’s assume that you have inherited a house. In this case, you’ll have three options. You’ll be able to move into a house, rent it out or sell it. People choose to sell inherited properties for many reasons. It’s worth noting that owning an inherited house can be too expensive. You’ll have to deal with property taxes, home owner’s insurance as well as electricity and heating bills. Plus, an inherited house may have an existing mortgage. In this case, you’ll have to take over mortgage payments. That means that if you inherit a house your expenses will increase. So, if you don’t want to rent out an inherited house then the best thing you can do is to sell it. There are also situations when inherited property needs to be divided between siblings or other relatives. If this is the case, homeowners are likely to choose to sell an inherited property. In fact, selling an inherited house is not as easy as many people believe. You need to know that sellers face a lot of challenges along the way. In this blog, we’ll give you some insights into selling an inherited house. Finally, you’ll know what happens when you sell an inherited house. According to the law, you have to pay a tax each time you make a profit from selling a property. In other words, you have to pay a tax if you sell a property at the price that’s higher than the purchase price. Actually, you are paying a tax on capital gain. This type of property tax is also known as a capital gains tax. It’s important to know that you’ll also have to pay a capital gain tax if you make a profit from selling an inherited house. Therefore, you’ll have to deal with a capital gain tax only if an inherited home’s value has increased after the owner’s death. A seller can also be a candidate for capital gain tax exclusions. If, for example, you have lived in a property for at least two of the last five years then you are eligible for an exclusion of up to $250,000 (married couples are eligible for an exclusion of up to $500,000). That’s why it makes a lot of sense for home owners to wait some time and sell a property later. However, you are not eligible for any type of capital gain tax exclusions if you are selling an inherited house. It’s a common knowledge that different types of renovations add to home’s value. That’s the reason why so many sellers choose to renovate a kitchen or bath prior to sale. So, a big question is – will your tax bill increase if you choose to make home improvements? Luckily, home improvements don’t affect a tax bill. Keep in mind that you’ll be able to deduct the amount you have spent on home renovations from your capital gain. It’s fair to say that selling an inherited house is a very challenging task. However, things will certainly go much easier if you choose the right strategy. It’s clear that you should do your best to sell your inherited property at the highest possible price. Follow our tips to sell an inherited house in the best possible way. – First and foremost, you need to get your inherited house ready for sale. What does the preparation actually mean? The first thing that you need to do is to prepare all the necessary documents for selling your property. After that, you should clean your inherited property and remove all personal belongings of a person who passed away. If you have time and money you can also make some home improvements. Remember, small changes can make a big difference! You can increase an inherited home’s value significantly by renovating your kitchen or bath and making various types of repairs. – Another important step you need to take is to get your inherited house valued. This will help you figure out how much your inherited property is worth. Obviously, you should consult with an experienced real estate agent. It’s a great idea to ask several realtors to value your property. You can also do your own market research and study similar properties available for sale. As a result, you’ll be able to get the whole picture on what is happening on the market these days and, most importantly, price an inherited property correctly. – Have you prepared your inherited property for sale and already know how much it costs? If so, you need to try selling your property. First of all, you need to decide how you’ll sell your inherited house. Actually, you’ll have several options. Let’s discuss each of them in detail. 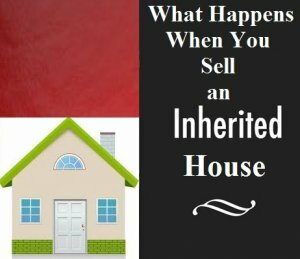 A lot of people choose to sell an inherited house with a realtor. You should know that this method has its pros and cons. The main drawback is, of course, a realtor’s fee that makes your property more expensive. You may also find it hard to select a good real estate agent who can do a great job and sell your inherited house successfully. You can also try to sell an inherited property on your own. In this case, however, you’ll have to spend a lot of time. When selling a property without a realtor you’ll have to market your property by yourself, receive a lot of phone calls from potential clients and schedule showings. Obviously, you’ll have to deal with a lot of stress and challenges if you choose to sell an inherited property by yourself. Selling an inherited house to a real estate investor is the perfect option for those who would like to sell a property fast and easy. Bear in mind that if you choose to take advantage of this option you’ll be able to sell your property for cash within 7 days. If you would like to sell a house even faster you can make a deal in the next 24 hours. A real estate investor gives you an opportunity to sell an inherited house and get cash the same day! For a confidential cash offer on your San Antonio area home, contact us today by calling (210) 693-1533 or filling out the form on this page.